Michigan is known for being the bowling capital of the world. "...the number of bowlers and alleys per capita in Michigan has always been among the highest in the U.S., due, in part, to the proliferation of auto company leagues, a phenomenon that stretched out into other workplaces." Bowling Alleys were a part of my upbringing. My parents met at a dance at Continental Lanes in Roseville. Adults around me all seemed to belong to bowling leagues. Elementary school field trips were often to bowl. 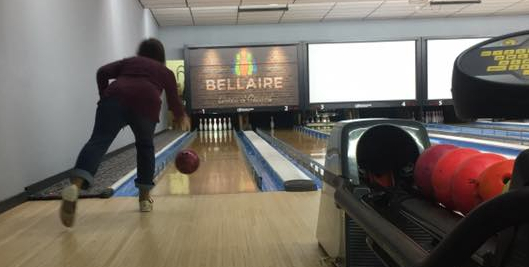 Yesterday we bowled ourselves silly at Bellaire Lanes and Games. Recently remodeled and reopened by new owners, without a trace of cigarettes from its previous life. I typically bowl double digits--even with bumpers. But, my ball matches my shirt!